Did your heart break just like your favorite vase did when it slipped out of your hand and fell to the floor? Has the handle broken off of that beautiful tea cup that your grandmother loved so many years ago? Would you like to do something really special for your teenage daughter’s graduation—maybe something with that Beatrice Potter bowl that she used as a child? 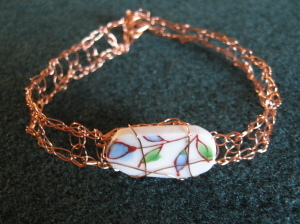 Marjorie also crochets with wire, creating unusual and striking necklaces and bracelets that go so well with her broken china work, such as this lovely copper bracelet designed using Richard Ginori china from Italy. To go along with her “cracked” theme, Marjorie now also includes sea glass and unusual broken shell jewelry in her repetoire. Each piece is a one-of-a-kind creation—beautiful and affordable. Choose something from her extensive inventory, or she will work with you to create a custom-designed piece. Wearing Marjorie’s jewelry is like wearing a bit of history and is a totally “green” experience. I love Marjories jewelry! I used to be into creating mosaics from brokent pottery..but never thought of jewelry..and I’m a jewelry artist! She really has something unique and special! Marjorie is, without doubt, a super-talented lady but not only that, she’s a lovely person too. I’ve purchased from Marjorie’s on-line store. The service is excellent. In fact, it was the perfect shopping experience and Marjorie managed to exceed all my expectations. 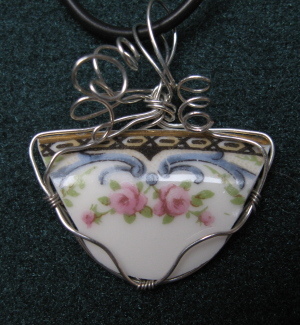 I love, love, love, the idea of creating something new out of a broken piece of China. It’s genius! I’ll be shopping at Cracked Plate Jewellery for some of my Christmas presents. The only problem being that her jewellery is so delightful, I may have to keep it for myself. I love my friends dearly but I also love Marjorie’s jewellery! I never saw such kind of jewelry before!